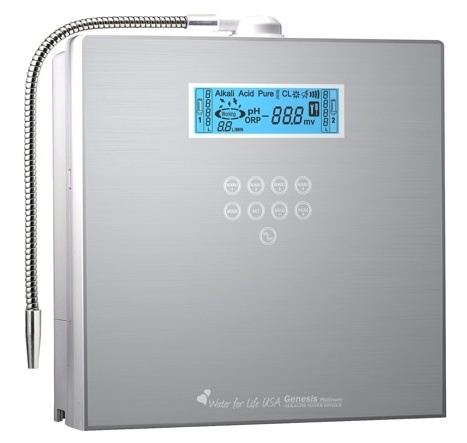 Like all our other alkaline water ionizers, the Genesis Platinum water ionizer has the ability to turn ordinary tap water into water with the ability to effectively counter the three most probable causes of sickness, chronic disease and premature aging; (1) high acidity levels in the body, technically called acidosis, (2) damaging run away free radical activity and (3) body dehydration. High body acidity is caused primarily by the foods we eat and the beverages we drink. Ideally our diet should be 80% alkaline and 20% acidic. In reality the American diet is just the opposite. Highly acidic foods include animal protein, grain products, dairy products, most beans, fats and oils and even some fruits and vegetables. High acidity beverages include alcohol, soft drinks, most sports and energy drinks, reverse osmosis water (most bottled water is R/O water), and coffee. As you can see, it is very difficult to consistently eat an alkaline diet. 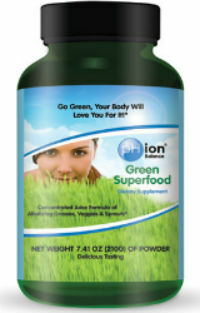 When body pH is lowered (towards acidic) ALL major bodily functions are negatively affected. High acid intake results in the creation of excess acidic waste. To protect kidneys and liver, our chief detoxification organs from acidic overload, the body stores excess acidic waste in fat cells. In a continually acidic internal environment, these fat cells continue to accumulate resulting in gradual and consistent weight gain. The blood must remain at a very precise alkaline pH of 7.365. Should blood pH drop to pH 7.0, we will go into a coma and die. To buffer blood pH, the body steals minerals from bones, a direct cause of osteoporosis. High acidity levels in the body also hinder the body’s ability to circulate blood, raising blood pressure. Alkaline ionized water at pH levels between 8.5 and 9.5 is VERY effective at neutralizing body acidity, helping to return the body to an alkaline state. 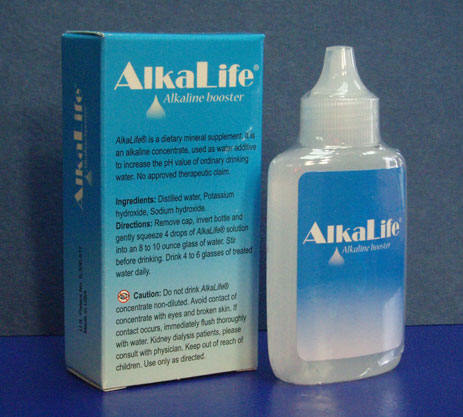 It is a significant fact that disease will easily germinate and flourish in an acidic environment whereas it literally CANNOT SURVIVE in an alkaline environment. 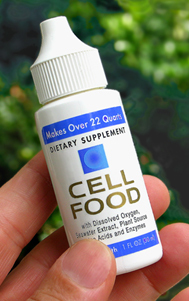 Free radicals are molecules that are missing an electron and are therefore chemically unstable. 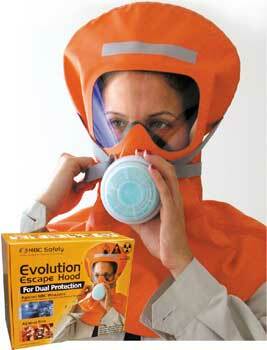 To become stable, a compelling chemical urge, a free radical must find an electron – somewhere. Free radicals can and will attack and steal electrons from healthy cells damaging them, killing them or alternating their DNA. 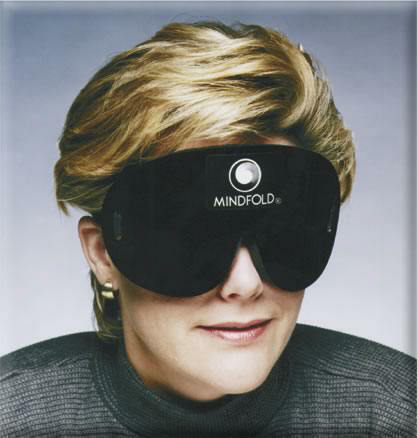 Free radical damage has been directly linked to cancer. A substance that contains easily accessible or free electrons that can be used as an alternate source of electrons by free radicals is called an antioxidant. Alkaline ionized water contains huge numbers of OH negative ions, molecules that have an extra electron, making alkaline ionized water a VERY POWERFUL antioxidant. As a side benefit, the interaction between OH negative ions and free radicals produces Oxygen providing the body with LOTS of NATURAL energy! 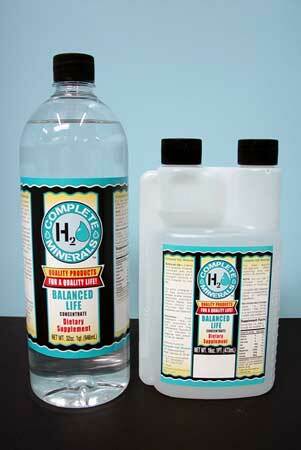 Alkaline ionized water is restructured making it up to six times more hydrating than ordinary water. Smaller water clusters more effectively penetrate cells resulting in much more efficient delivery of nutrients and oxygen to cells and removal of waste material and toxins from cells. Alkaline ionized water actually enables the body to heal itself and to keep itself healthy and free of sickness and disease, what it was designed to do. Alkaline ionized water is very similar in nature to the famous miracle water of Lourdes France, considered by many to be the fountain of youth. Why drink Genesis Platinum Water? 1) The Genesis Platinum removes 99.9% of toxins and pollutants from water to provide you with safe and healthy water. 2) Because of it's purity and mineral balance, Genesis Platinum water tastes better than other waters, including expensive bottled waters (even the REALLY expensive ones!). 3) The Genesis Platinum is a fraction of the cost of buying bottled water, less than one cent per liter. 4) The Genesis Platinum water makes cooked food taste better because it dissolves the acid in it. 5) The Genesis Platinum water removes harmful acids and toxins built up in your cells, helping your body to fight the aging process. 6) The Genesis Platinum is scientifically enhanced to energize the body, similar to a sports drink. However, sports drinks contain sugar and chemicals. Genesis Platinum water is pure. 7) The Genesis Platinum dissolves nutrients and minerals more thoroughly than regular water, so it is easier for your body's cells to absorb them, leading to better health. 8) The Genesis Platinum water provides an abundance of oxygen to your cells, which vitalizes your body. This helps your body heal faster and stay healthy. 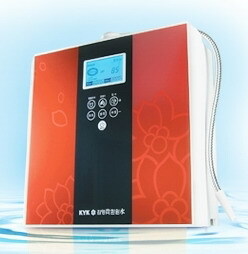 In fact, electrolyzed water aids the body in electrical and thermal conductivity. 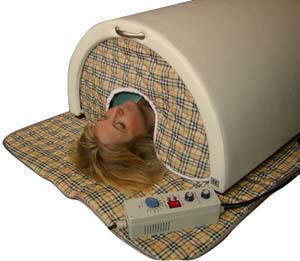 This means it is easier for your body and brain to communicate and repair the body naturally. 9) The smaller water clusters aid in the enzymatic breakdown of food and make it easier for the body to digest food and absorb the nutrients. This water will help your body absorb 30% more nutrients than tap water. 10) The Genesis Platinum naturally creates antioxidants in the water that neutralize active oxygen (free radicals) that build up in your cells. Your body will naturally detoxify. 11) The Genesis Platinum water will help make your pets, children, and house plants healthier. 12) The Genesis Platinum comes with a five year unlimited parts, labor and shipping warranty and a sixty day money back guarantee. With 300 watts of power, the Genesis Platinum can create the perfect water for any situation, including the best drinking water for you and your family. 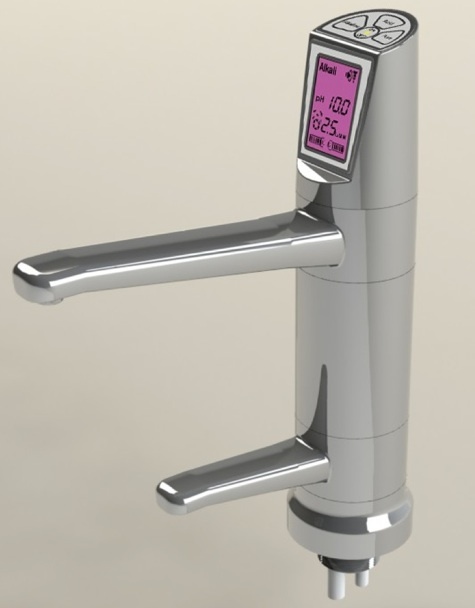 Plus it has 7 platinum titanium plates, 76 levels of pH and ORP adjustment, a large LCD seven color screen, and two .1 micron multi-stage activated carbon filters to get your tap water clean. 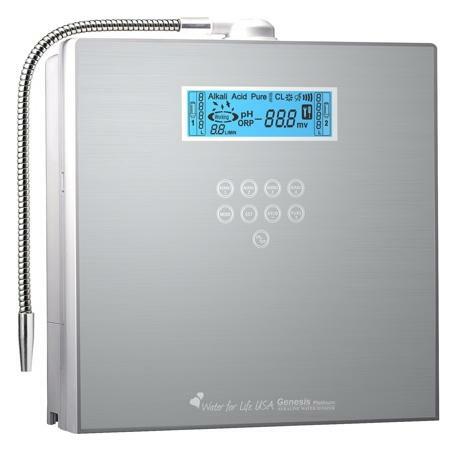 Don't let our competitors fool you -- with 300 watts of power this is the most powerful water ionizer on the market, even stronger than those nine plate models. The truth is, there is only so much ionization that can be done to water. The Genesis Platinum tops out at a range of 13 pH to 1.6 pH! Almost the entire pH range! Even if you had nine plates, or twelve plates, or even more than that, you can't ionize the water any more. Cover a surface area of 200 sq. inches. Made from the most precious materials on earth. The Genesis Platinum allows you to program nearly any pH and ORP combination so you may easily customize pH and ORP to the level that's right for you and your family. Genesis Platinum uses a premium acitvated carbon filter as well as a specialized media filter to improve the filtration of tap water contaminants including fluoride, chlorine and heavy metals. Microchips are built into the outside of the filter casings which monitor filter life & contamination levels and indicate the exact time to change your filter. 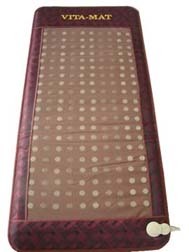 Applies stable power overcoming issues such as heat, noise and loss of power. For displaying pH & ORP estimations + reading the auto-diagnosis system, filter life, flow rate, and more. The Genesis Platinum was designed with ease of use in mind. 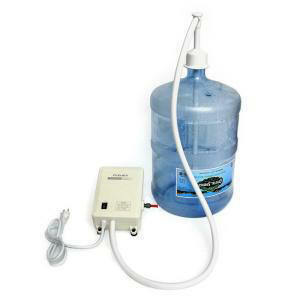 There is no need to manually adjust your water flow. The Genesis Platinum system will automatically turn your water on, filter it, and ionize it. Another smart feature of the Genesis Platinum. The Genesis Platinum automatically cleans as you use it. No waiting, just fresh, ionized water every time. The Genesis Platinum continually monitors six internal operating systems ensuring product safety & optimal performance. Drains water from the electrolysis cell system and filter, to enhance full system cleaning and greatly expand the life-span of the Genesis Platinum system above and beyond other standard ionizer systems. Auto controls the pH and ORP of your water by adjusting the ionization according to the mineral content of your tap water. This allows the Genesis Platinum to estimate and display the pH and ORP of your water. The Genesis Platinum notifies you of each system function with soothing voice prompts, chimes, and soft music, all of which have five volume levels, as well as mute. Monitors and displays the exact water flow rate, ensuring accurate pH and ORP levels in your water. The sleek look & compact design of the Genesis Platinum can easily fit in with any decor in your kitchen or home. Superior Materials All Genesis Platinum systems utilize quality machinery, leak proof stainless steel adapters & non-toxic food-grade hose and plumbing. More reasons why Genesis Platinum is the smart choice! Warranty 5 years parts and labor. Filter Implementation Dual Cartridge Filters: First filter: can treat up to about 4,000ℓ, Second filter: can treat up to 8000 liters. If you buy filters that promise 6000 liters for filter #1 you could be drinking dirty water after 4000 liters. Don't be fooled our filters are the very best quality. This is for customers who use reverse osmosis filtration as a prefilter for their Genesis Platinum or have very acidic source water. Reverse osmosis filtration removes all the minerals from your tap water, so these filters are necessary to remineralize your water. They are inserted into the filter #1 and filter #2 compartments of the Genesis Platinum in place of the regular filters. They should be replaced every six to nine months just like regular filters. The Cleaning Cartridge will clean the plates of the Genesis Platinum and is inserted in the filter #2 compartment. 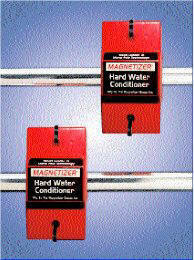 This is recommended for customers with hard water with scaling issues that may interfere with the Genesis performance. 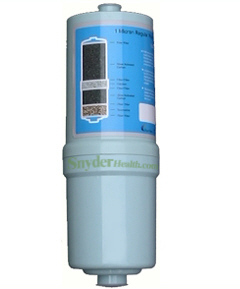 If you have hard water, you should use the cleaning cartridge once every six to nine months. 1) Remove #2 filter from Genesis. 3) Press the "on" button to run water on the "pure" water level for about 20 seconds or until you see white foam. 4) Press the "off' button to turn off water. 5) Let foam clean plates for about five minutes. 6) Run water for about five minutes until there is no more white foam. 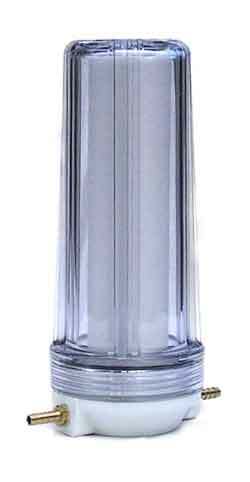 7) Replace cleaning cartridge with your #2 filter. The cleaning cartridge is one time use only.